A few months ago I jumped into a Kaggle competition at the last minute. My laptop didn’t have enough memory to handle the data set. And, I wanted more CPUs to throw at the problem. So now I had a great excuse to get myself set up to use Amazon cloud computing. If you haven’t already, register for an AWS account. 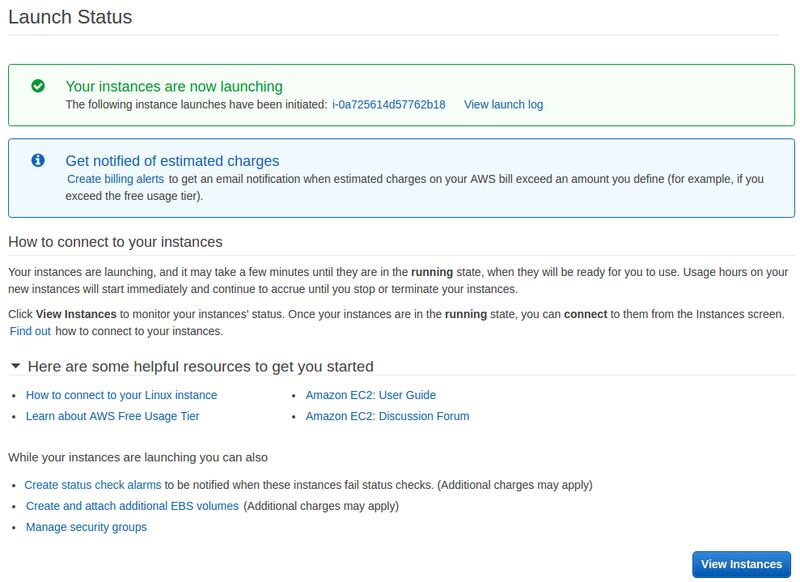 Navigate to AWS services -> EC2. 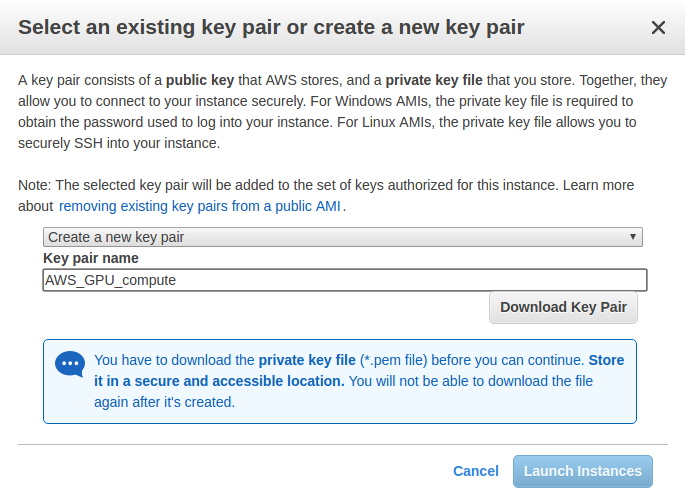 Find [Launch Instance] button and click it. We will select p2.xlarge instance. This is the lowest tier of GPU servers. 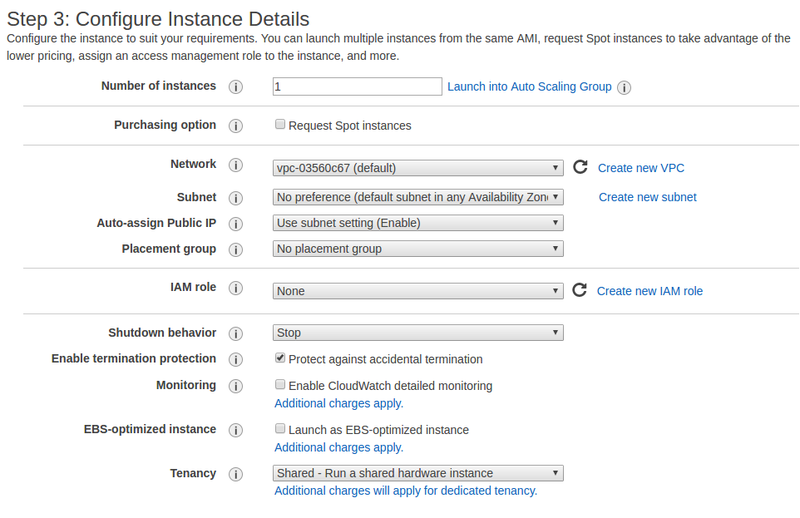 Once everything is set up, the instance type can be quickly changed depending on the size of your job. EBS-optimized instances provide better data throughput to the SSD storage. You can optionally select this. I am starting with 100GB of General Purpose SSD (GP2) storage. I have unclicked the Delete on Termination box - this is important. The alternative is to take a snapshot of your machine before terminating your instance. Or, mounting a drive with your software installations. These are manageable approaches, but a pain I think. Note: This approach costs more money, because your storage is always set aside. The cost is on the order of $0.10/GB/month. Scroll to the bottom-right and click View Instances. This will take you to your EC2 dashboard and you should see your instance with a green status bubble. Let’s SSH to the instance and make sure everything is working. Congratulations, but we better do something a bit more useful with the compute power now at our fingertips! Build config file, it will be put in ~/.jupyter/jupyter_notebook_config.py. This is where you will put your notebook password (to be generated next). You’ll get a warning about an unsigned certificate (you know, the one you generated a few steps earlier). You can safely ignore this (usually by clicking on advanced option in your browser window). Then you’ll see the password page of your Jupyter notebook. Enter the password you generated earlier and you are in. Do a quick check, perhaps import numpy as np and generate a random array and print it. You need to download 2 items from nVidia so TensorFlow can use the GPU. # Fix port 20 Broken Pipe issue. At the beginning of the example run, you will see messages about CUDA libraries being load. Then, more exciting, the GPU is found. And, finally the NN trains very quickly and achieves better than 99% accuracy on the test set. I hope you made it this far. I love being able to launch instance(s) with as many CPUs or GPUs as I want. Now you can run multiple large jobs in parallel and monitor their progress using a Juypter Python Notebook. Important Reminder: When you are done, STOP your instance using the AWS dashboard. Otherwise you will rack up charges ($$$). It is important you choose STOP and NOT terminate. If you terminate your instance, you will lose all the data on your SSD. It is also good practice to save an image of your instance from time to time. If any of the instructions above are confusing or just plain wrong, please post a comment below. Suggestions for improvements also welcome.